A person with diabetes constantly manages their blood's sugar (glucose) levels. After a blood sample is taken and tested, it is determined whether the glucose levels are low or high. Following your health care provider's instructions, if glucose levels are too low, carbohydrates can be ingested. 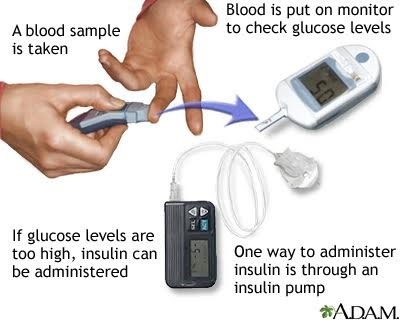 If glucose in the blood is too high, the appropriate amount of insulin can be administered into the body such as through an insulin pump. Updated by: Shehzad Topiwala, MD, Chief Consultant Endocrinologist, Premier Medical Associates, The Villages, FL. Review provided by VeriMed Healthcare Network. Also reviewed by David Zieve, MD, MHA, Medical Director, A.D.A.M. Health Solutions, Ebix, Inc.